The term 'capital' is generally used by economists to describe a stock of anything that has the capacity to generate a flow (normally of goods and services) that benefits — and is valued by — people. The emergence of the concept of natural capital in recent decades reflects the recognition that environmental systems play a fundamental role in determining economic output and human well-being — providing resources and services, and absorbing emissions and wastes. Natural capital is the most fundamental of the core forms of capital (i.e. manufactured, human, social and natural) since it provides the basic conditions for human existence. These conditions include fertile soil, multifunctional forests, productive land and seas, good quality freshwater and clean air. They also include services such as pollination, climate regulation and protection from natural disasters (EU, 2013). Natural capital sets the ecological limits for our socio-economic systems; it is both limited and vulnerable. The 'flow' provided by natural capital comes in the form of ecosystem services. Ecosystem services are the contributions that ecosystems make to human well-being (Figure 3.1). The main categories are provisioning services (e.g. biomass, water, fibre); regulating and maintenance services (e.g. soil formation, pest and disease control); and cultural services (e.g. the physical, intellectual, spiritual and symbolic interactions with ecosystems, landscapes and seascapes) (CICES, 2013). These three types of services are underpinned by supporting services (e.g. nutrient cycling) and are provided at a range of scales from the global (e.g. climate regulation) to the local (e.g. flood protection). Source: Maes et al., 2013. The complexity of natural systems and irreversibility of some environmental change mean that replacing natural capital with other forms of capital is often impossible (a phenomenon known as non-substitutability) or carries significant risks. The risks and costs from continued degradation of ecosystems and their services have not yet been properly integrated in our economic systems, social systems, and decision-making. The state and prospects of natural capital provide an indication of the environmental sustainability of our economy and society. While Europe has undoubtedly made progress in preserving and enhancing its semi-natural systems in certain areas, continued overall loss of natural capital is jeopardising efforts to attain biodiversity and climate objectives (EU, 2013). Most of the pressures on Europe's natural capital are fundamentally based in the socio-economic systems of production and consumption that provide for our material well-being. Economic and demographic projections suggest that these pressures are likely to grow. Applying the concept of capital to nature raises some difficulties. These include concerns about the growing commodification of the world and a lack of recognition of the intrinsic importance of biodiversity and of a clean, healthy environment. In this context it is important to emphasise that natural capital is not the same as nature; natural capital is the basis of production in the human economy and the provider of ecosystem services. Therefore any socio-economic valuation of Europe's natural capital, while an important tool to integrate monetary values into economic systems and related policies, should go hand-in-hand with recognition that economic valuation will not fully include the intrinsic value of nature or the cultural and spiritual services that it provides. reflections on the scope for long-term, interconnected ecosystem-based management approaches (Section 3.10). The European Union and its Member States — as well as many neighbouring countries in Europe — have introduced a substantial amount of legislation to protect, conserve and enhance ecosystems and their services (Table 3.1). A wide range of European policies affect and benefit from natural capital. These include the Common Agricultural Policy, Common Fisheries Policy, cohesion policy, and rural development policies. The ultimate objective of these policies may not be protection of natural capital. Nevertheless, legislation to tackle climate change, chemicals, industrial emissions and waste helps to ease the pressures on soil, ecosystems, species, and habitats as well as reducing nutrient releases (EU, 2013). Note: For more detailed information on specific policies, see the respective SOER 2015 thematic briefings. More recently, EU policies such as the 7th Environment Action Programme and the Biodiversity Strategy to 2020 (EC, 2011b; EU, 2013) have shifted towards a more systemic perspective on the issue, explicitly addressing natural capital. A priority objective of the 7th Environment Action Programme is 'to protect, conserve and enhance the Union's natural capital', and this objective is set in the context of a longer-term vision that 'by 2050 we live well, within the planet's ecological limits… natural resources are managed sustainably, and biodiversity is protected, valued and restored in ways that enhance society's resilience'. Resilience refers to the ability to adapt to or tolerate disturbance without collapsing into a qualitatively different state. Enhancing society's resilience will only be possible by maintaining and enhancing ecosystem resilience because social, economic and ecological sustainability are interdependent. When we undermine ecosystem resilience, we reduce nature's capacity to provide essential services, putting growing pressure on individuals and society. Conversely ecological sustainability depends on social factors and decisions to protect the environment. The complex nature of ecosystem degradation (multiple causes, pathways and effects that are difficult to disentangle) leads to challenges in translating the concept of ecological resilience into policy. Policy initiatives have sought to overcome these challenges by using concepts such as 'good ecological status' and 'good environmental status' for water bodies, or 'favourable conservation status' for habitats and species. However, the relationship between ecosystem resilience, decreasing environmental pressures, and improvements in resource efficiency is often ill-defined. There are weaker links between resilience and policy measures and targets than between resource efficiency and policy measures and targets. Biodiversity is the variety of life and includes all living organisms found in the atmosphere, on land and in water. It encompasses diversity within and among species, habitats and ecosystems. Biodiversity underpins ecosystem functioning and the provision of ecosystem services. Despite these benefits and despite biodiversity's importance for humans, biodiversity continues to be lost, mainly due to pressures caused by human activities. Changes in natural and semi-natural habitats — including loss, fragmentation and degradation — impose considerable negative impacts through urban sprawl, agricultural intensification, land abandonment, and intensively managed forests. Overexploitation of natural resources — in particular fisheries — remains a large problem. The accelerated establishment and spread of invasive alien species is not only an important driver of biodiversity loss, it also causes considerable economic damage (EEA, 2012g, 2012d). The increasing impacts from climate change are already affecting species and habitats, exacerbating other threats. These impacts are projected to become progressively more significant in the coming decades (EEA, 2012a). Encouragingly, some pollution pressures such as emissions of sulphur dioxide (SO2) have decreased; but others, such as atmospheric nitrogen deposition, remain a problem (EEA, 2014a). In 2010, it was clear that neither the global nor the European target of halting biodiversity loss had been met, despite important progress in nature conservation measures in Europe. This progress included the expansion of the Natura 2000 network of protected areas and the recovery of some wildlife species e.g. large carnivores. 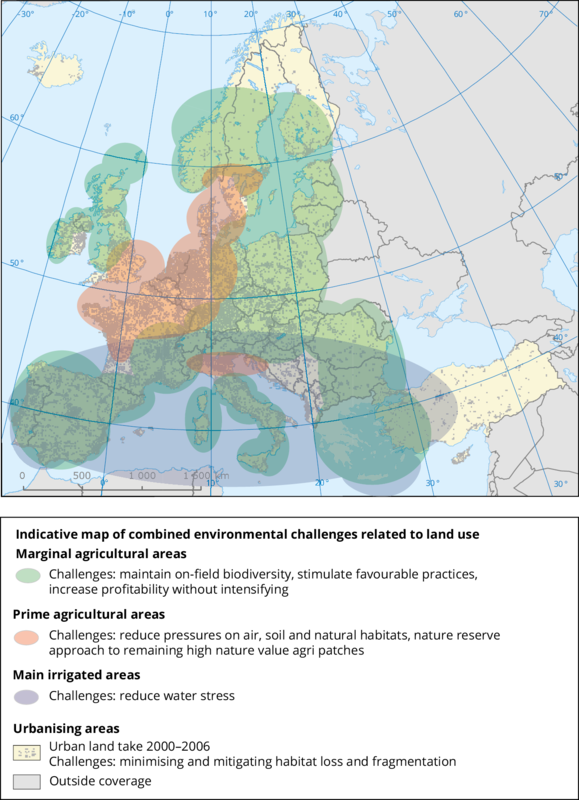 In 2011, the European Commission adopted the Biodiversity Strategy to 2020 with the headline target of 'halting the loss of biodiversity and the degradation of ecosystem services in the EU by 2020, and restoring them in so far as is feasible, while stepping up the EU contribution to averting global biodiversity loss'. This goal is complemented by six targets aimed at conserving and restoring nature, maintaining and enhancing ecosystems and their services, addressing specific drivers of biodiversity loss (agriculture, forestry, fisheries, invasive alien species), and averting global biodiversity loss. Much is still unknown about the complete status and trends of European biodiversity and how these relate to the functioning of ecosystems and the long-term delivery of ecosystem services. Nonetheless, available information on protected species and habitats gives rise to concern. The Habitats Directive Article 17 assessment for 2007–2012, shows that only 23% of animal and plant species and only 16% of habitat types were considered to be in a favourable conservation status (Figure 3.2). 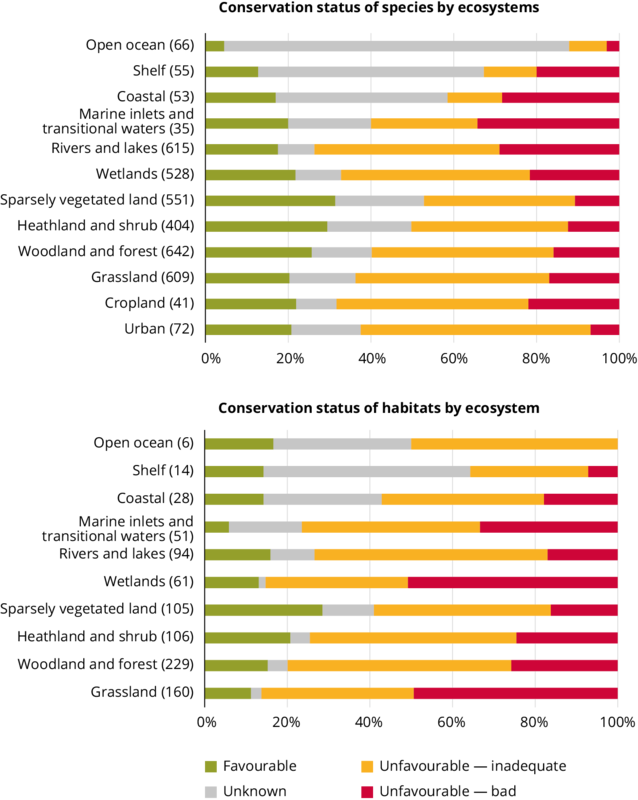 The breakdown by ecosystem type shows that for both species and habitats the overall percentage in favourable condition is higher in terrestrial ecosystems than in freshwater and marine ecosystems. The main change from the 2001–2006 assessment is a reduction in the proportion of assessments where conservation status is unknown, from 31% to 17% for species and from 18% to 7% for habitats, illustrating improvements in the knowledge and evidence base. A high proportion of species (60%) and habitats (77%) assessed in the 2007–2012 assessment remain in unfavourable condition. For species, this represents an increase from 52% in the 2001–2006 assessment and for habitats, an increase from 65%. As there have been methodological changes from the previous reporting period, it is not possible to say whether this represents a deterioration in condition or reflects the improvements in the knowledge base. In addition, even with greater societal responses to biodiversity loss, positive actions can take time to have an impact on the status of biodiversity. A significant achievement has been the expansion of the Natura 2000 network of protected areas to 18% of EU land area and to 4% of EU marine waters. Conserving and managing these and other nationally-designated areas (and enhancing their coherence through developing green infrastructure, such as wildlife corridors) is a critical step to protect Europe's biodiversity. Achieving a significant and measurable improvement in the status of species and habitats will require the full and effective implementation of the Biodiversity Strategy to 2020 and of EU nature legislation. It will also require policy coherence between relevant sectoral and regional policies (e.g. agriculture, fisheries, regional development and cohesion, forestry, energy, tourism, transport, and industry). 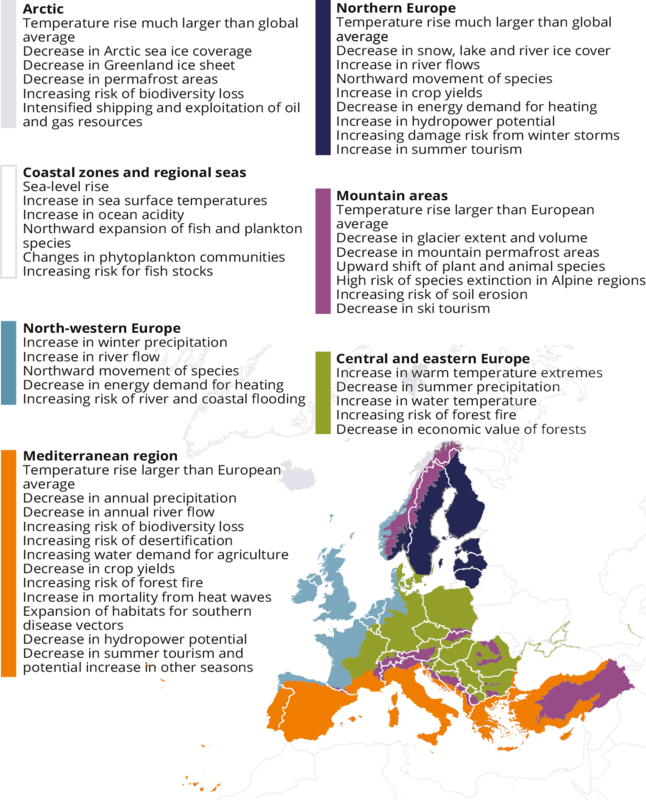 Consequently, the fate of European biodiversity and the ecosystem services it underpins is closely intertwined with policy developments in these areas. In addressing biodiversity, Europe must also look beyond its own borders. High per-capita consumption is ultimately an underlying cause for many of the drivers causing biodiversity loss; and in today's increasingly globalised economy, international trade chains accelerate habitat degradation far away from the place of consumption. Consequently, European efforts to halt biodiversity loss should ensure that pressures are not transferred to other parts of the world thereby exacerbating global biodiversity loss. Land use is a major factor influencing the distribution and functioning of ecosystems and thus the delivery of ecosystem services. The degradation, fragmentation and unsustainable use of land is jeopardising the provision of several key ecosystem services, threatening biodiversity, and increasing Europe's vulnerability to climate change and natural disasters. It is also exacerbating soil degradation and desertification. More than 25% of the EU's territory is affected by soil erosion by water, which compromises soil functions and freshwater quality. Soil contamination and soil sealing are also persistent problems (EU, 2013). Urbanisation is the dominant trend in European land-use change, and in combination with land abandonment and intensification of agricultural production this is leading to a decline in the area of natural and semi-natural habitats. In place of these natural and semi-natural habitats come commercial, industrial, mining, or construction sites, a change referred to as land take. Urbanisation also means that those natural and semi-natural habitats that remain are increasingly fragmented by built-up areas and transport infrastructure. 30% of the EU's territory is highly fragmented, affecting the connectivity and health of ecosystems. This also affects the ability of ecosystems to provide services, and to provide viable habitats for species (EU, 2013) (see also Section 4.10). Available data show that close to half of land take has come at the expense of arable farmland and permanent crops, nearly a third at the expense of pastures and mosaic farmland, and over 10% at the expense of forests and transitional woodland shrubs (EEA, 2013j). As these land-cover types are substituted to varying degrees by impervious cover, this affects the provision of important services provided by soils, such as the storing, filtering, and transforming of substances such as nutrients, contaminants, and water. Land take is a long-term change, which is difficult or costly to reverse. It is now becoming evident that there are complex trade-offs between land-use patterns, the environmental pressures generated by that land use, and social and economic needs (Map 3.1). There has been a variety of commitments on land use at both international and national level. The Rio+20 outcomes (UN, 2012a) call for a land degradation neutral world, while the EU has an objective of 'no net land take' by 2050. EU policy also calls for targets to be set for sustainable use of land and soil (EU, 2013). Limiting land take is also already an important land policy target at national and sub-national level (ETC SIA, 2013). The European Commission is currently preparing a communication on land as a resource. It has indicated that its aim is to unify these commitments on land use and spatial planning into a coherent policy that takes into account the respective competencies of the European Union and its Member States. In order to avoid increases in land take, incentives for land recycling and compact urban development may be worth pursuing. Adopting a landscape perspective and green infrastructure approaches (which embrace an area's physical characteristics and the ecosystem services it provides) is a useful way to foster integration between different policy areas. This can also help address fragmentation and manage trade-offs. The policy areas of agriculture and spatial planning are especially suited to integration of this sort, as there are strong interactions between agricultural land-use and European and global environmental processes. The main aim of European and national water policy is to ensure that throughout Europe, a sufficient quantity of good-quality water is available for people's needs and for the environment. In 2000, the Water Framework Directive established a framework for the management, protection and improvement of the quality of water resources across the EU. Its main objective is that all surface water and groundwater should hold good status by 2015 (unless there are grounds for exemption). Achieving good status means meeting certain standards for the ecology, chemistry, morphology and quantity of waters. Water quantity and quality are closely linked. In 2012, the 'Blueprint to Safeguard Europe's Water Resources' stressed that a key element of meeting the standard of good status is ensuring that there is no over-exploitation of water resources (EC, 2012b). In 2010, EU Member States released 160 River Basin Management Plans aimed at protecting and improving the water environment. The plans covered the period 2009–2015, with the second set of River Basin Management Plans covering the period 2016–2021 due for finalisation in 2015. Over the last few years, European countries that are not EU Member States have developed similar river basin activities to those introduced by the Water Framework Directive (Box 3.2). Norway and Iceland have activities for implementing the EU Water Framework Directive (Vannportalen, 2012; Guðmundsdóttir, 2010), and in Switzerland and Turkey, there are water policies comparable to the Water Framework Directive regarding water protection and management (EEA, 2010c; Cicek, 2012). In these countries outside the EU, a large proportion of waters are affected by similar pressures as those identified by the EU River Basin Management Plans. Many of the West Balkan river basins are heavily affected by hydromorphological alterations and pollution from municipal, industrial, and agrochemical sources. This pollution is a major threat to freshwater ecosystems (Skoulikidis, 2009). In Switzerland there are significant deficits in the ecological status of surface waters, particularly in the intensively used lowland areas (Swiss Plateau) with recent assessments showing that 38% of medium and large river sites have insufficient macroinvertebrate quality and that roughly half of the total river length (below 1 200 m above sea level) is in a modified, non-natural, artificial or covered state. Countries are also involved in transboundary activities. The Sava is the third-longest tributary of the Danube, and runs through Slovenia, Croatia, Bosnia and Herzegovina, and Serbia, with part of its catchment in Montenegro and Albania. The International Sava River Commission is working together with these countries on the development of the Sava River Basin Management Plan, in line with the Water Framework Directive. Similarly, Switzerland cooperates with neighbouring states to achieve water protection goals, and thus indirectly adopts certain principles of the Water Framework Directive. In 2009, 43% of surface water bodies were in good or high ecological status, and the Water Framework Directive objective of reaching good ecological status by 2015 is only likely to be met by 53% of surface water bodies (Map 3.2). This constitutes a modest improvement and is far from meeting policy objectives. Rivers and transitional waters are on average in a worse condition than lakes and coastal waters. Concerns about the ecological status of surface water bodies are most pronounced for central and north-western Europe in areas with intensive agricultural practices and high population densities. The status of coastal and transitional waters, in the Black Sea and greater North Sea regions is also of concern. Note: Switzerland data sets on river and lake water quality reported in the framework of EEA priority data flows are not compatible with the EU Water Framework Directive assessments and are not included above (see Box 3.2 for details). Pollution from diffuse sources affects most surface water bodies. Agriculture is a particularly large source of diffuse pollution, causing nutrient enrichment from fertiliser run-off. Agricultural pesticides have also been widely detected in surface and groundwater bodies. Hydromorphological pressures (changes to the physical shape of water bodies) also affect many surface water bodies. Hydromorphological pressures alter habitats and are mainly the result of hydropower, navigation, agriculture, flood protection, and urban development. The second set of River Basin Management Plans must include measures to reduce hydromorphological pressures if they cause less than good ecological status. Chemical status is another cause for concern. Around 10% of rivers and lakes are in poor chemical status, with polycyclic aromatic hydrocarbons a widespread cause of poor status in rivers, and heavy metals a significant contributor to poor status in rivers and lakes. Around 25% of groundwater has poor status, with nitrate being the primary cause. Notably, the chemical status of 40% of Europe's surface waters remains unknown. While there is relative clarity about the types of pressures encountered in river basins, there is less clarity on how these will be addressed and how measures will contribute to achieving environmental objectives. The next cycle of River Basin Management Plans (2016–2021) will need to improve this situation. In addition, improving efficiency of water use and adapting to climate change are major challenges for water management. Restoring freshwater ecosystems and floodplain rehabilitation as part of green infrastructure will help address these challenges. These actions will also deliver multiple benefits by using natural water retention methods to improve ecosystem quality, reduce floods and reduce water scarcity. Achieving healthy aquatic ecosystems requires taking a systemic view, as the state of aquatic ecosystems is closely connected to how we manage land and water resources, and to pressures from sectors such as agriculture, energy and transport. There are ample opportunities to improve water management to achieve policy objectives. These include stringent implementation of existing water policy, and integration of water policy objectives into other areas such as the Common Agricultural Policy, EU Cohesion and Structural Funds, and sectoral policies. Excessive nutrient (nitrogen and phosphorus) inputs in aquatic environments cause eutrophication, resulting in changes in species abundance and diversity, as well as algal blooms, deoxygenated dead zones, and leaching of nitrate to groundwater. All of these changes threaten the long-term quality of aquatic environments. This has implications for the provision of ecosystem services such as drinking water, fisheries, and recreation opportunities. Europe's waters are much cleaner than they were 25 years ago, due to investment in sewage systems to reduce pollution from urban wastewater treatment. Nevertheless, challenges remain. More than 40% of rivers and coastal water bodies are affected by diffuse pollution from agriculture, while between 20% and 25% are subject to point source pollution, for example, from industrial facilities, sewage systems and wastewater treatment plants (Map 3.3). Note: Switzerland data sets are not compatible with the EU Water Framework Directive assessments and so are not included above. Switzerland has high levels of point and/or diffuse pollution pressures, particularly in lowland areas. Nutrient levels in freshwater bodies are decreasing. Average levels of phosphate and nitrate in European rivers declined by 57% and 20% respectively between 1992 and 2011 (EEA, 2014q). This mostly reflects improvements in wastewater treatment and reductions in the levels of phosphorus in detergents, rather than the effect of measures to reduce agricultural inputs of nitrate at European and national levels. Although agricultural nitrogen balances are declining, they are still high in some countries, particularly in lowland western Europe. Measures to tackle agricultural pollution include improving the efficiency of nitrogen use in crop and animal production; conserving nitrogen in animal manure during storage and application; and full compliance with the Nitrates Directive. Improving cross-compliance (the mechanism that ties financial support for farmers to compliance with European laws) and tackling inadequate wastewater treatment and ammonia release from inefficient fertiliser management are particularly important for achieving further significant reductions in nutrient releases (EU, 2013). Reducing overall nutrient inputs to watersheds at the European scale also requires an approach that encompasses hydrological systems as a whole, because nutrient loading in rivers and surface waters has a downstream impact on transitional and coastal waters. Any measure to reduce nutrient inputs must also take into account time lags, as measures focused on rivers take a while to reduce pressures on coastal and marine environments. Air pollution harms both human and ecosystem health. It contributes to eutrophication, atmospheric ozone, and the acidification of water and soil. It also impacts agricultural production and forests, causing yield losses. Air pollution's most important effects result from emissions from transport, power generation and agriculture. Although there has been a reduction in emissions of air pollutants over the last two decades, the complex links between emissions and air quality mean that this does not always result in a corresponding improvement in the exposure of ecosystems to these pollutants. In recent decades there have been significant improvements in reducing ecosystem exposure to excess levels of acidification, and the situation is predicted to improve further over the coming 20 years (EEA, 2013h). However, there has not been the same degree of improvement regarding eutrophication. Most of continental Europe experiences exceedances of critical loads (the upper limit that an ecosystem such as a lake or forest can tolerate without damaging its structure or function) for eutrophication. It is estimated that around 63% of European ecosystem areas and 73% of the area covered by the Natura 2000 network of protected areas were exposed to air pollution levels that exceeded eutrophication limits in 2010. The projections for 2020 indicate exposure to eutrophication will still be widespread (Map 3.4). The divergence between levels of acidification and levels of eutrophication largely occurs because emissions of pollutants containing nitrogen (which can lead to eutrophication) have not fallen as much as emissions of sulphur (which causes acidification). Ammonia (NH3) emitted from agricultural activities and nitrogen oxides (NOX) emitted from combustion processes are the predominant air pollutants causing eutrophication (EEA, 2014d). The EU Air Quality Directive has an objective to protect vegetation from high ozone concentrations. Most vegetation and agricultural crops are exposed to levels above the target. In 2011, this comprised 88% of Europe's agricultural area, with the highest values observed in southern and central Europe (EEA, 2013h). European air policy has undergone substantial review, and proposals for the Clean Air Policy Package were adopted by the European Commission in late 2013. The package, which contains a range of measures and targets, is anticipated — if agreed and implemented as foreseen — to deliver a range of benefits. These benefits include protecting 123 000 km2 of ecosystems from excess eutrophication (including 56 000 km2 of protected Natura 2000 areas), and protecting 19 000 km2 of forest ecosystems from acidification by 2030 compared to a business-as-usual scenario (EC, 2013a). Beyond 2030, the time-frame of 2050 has been suggested as the time by which Europe should meet its long-term objectives of achieving levels of air pollution that do not lead to unacceptable harm to human health and the environment. Achieving these longer-term objectives and the necessary reductions in emissions will require integration of air, climate and biodiversity policies. 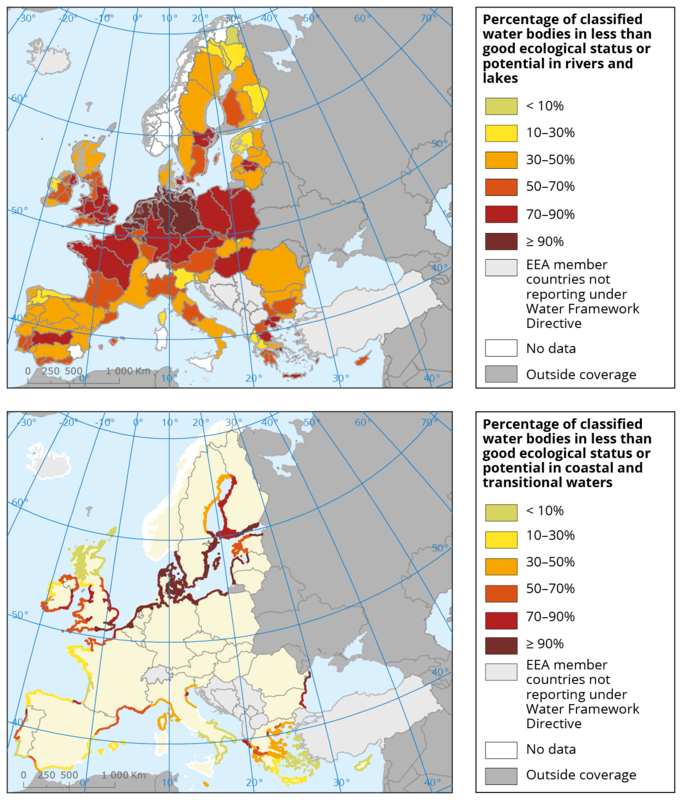 In addition, the transboundary effects of air pollution remain challenging and emission reductions in Europe may not be enough on their own to achieve the long-term objectives. Marine and coastal areas provide natural resources as well as access to trade, transport, opportunities for recreation, and many other goods and services. Maritime and coastal activities remain essential to the European economy and society, with high expectations for 'blue growth' i.e. sustainable growth in the maritime sector. The Marine Strategy Framework Directive is the environmental pillar of the Integrated Maritime Policy. Together with EU nature legislation and the Biodiversity Strategy to 2020, the Marine Strategy Framework Directive forms the basis of the EU's policy to achieve healthy, clean and productive seas by 2020. The main objective of the Marine Strategy Framework Directive is achieving 'good environmental status' by 2020, and at its core is the concept of implementing an ecosystem-based approach to the management of human activities in the marine environment. 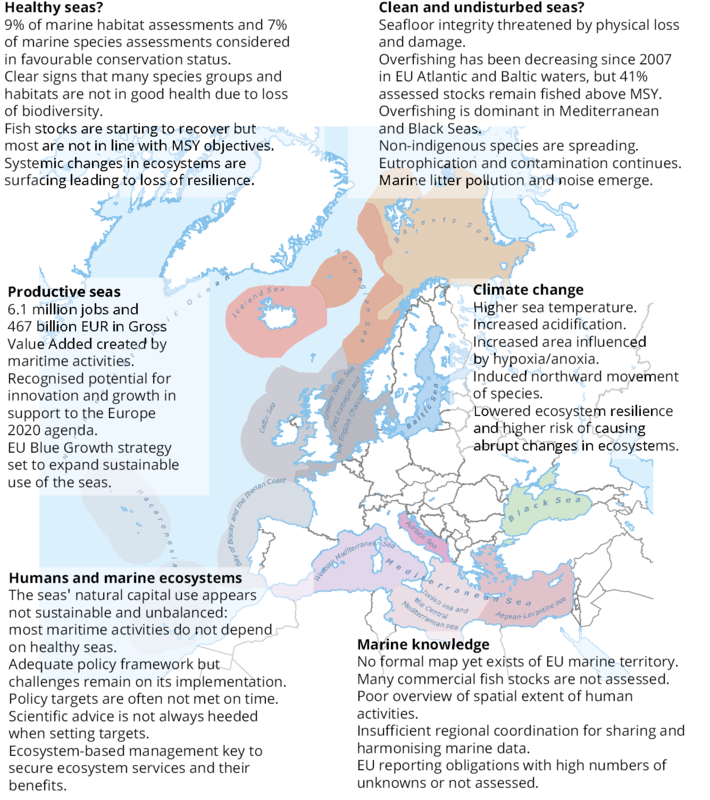 Europe's seas face a range of sustainability challenges (Map 3.5). Marine and coastal ecosystems and biodiversity are under pressure throughout Europe, and their status is of concern (Section 3.3). The target of achieving good environmental status by 2020 is at risk due to overfishing, sea floor damage, pollution by nutrient enrichment and contaminants (including marine litter and underwater noise), introduction of invasive alien species, and the acidification of Europe's seas. Source: Adapted from EEA, 2014k. Impacts from human activities have inadvertently combined to shift the balance of entire ecosystems, as witnessed in the Black and Baltic Seas, as well as some parts of the Mediterranean Sea. In response, European policies governing the coastal and marine environment now widely use an ecosystem-based approach, which aims to address the combined effects of multiple pressures. Targeted policy actions and committed management efforts towards balancing human activities can protect and restore species and habitats, helping preserve ecosystem integrity. The expansion of the marine Natura 2000 network of protected areas and of recent fisheries management efforts are examples of positive actions. For commercially exploited fish stocks, fishing pressure has been decreasing since 2007 in EU Atlantic and Baltic waters, with visible improvement in the status of the fished stocks. The number of assessed stocks in these waters fished above their maximum sustainable yield has fallen from 94% in 2007 to 41% in 2014. In contrast, 91% of assessed stocks in the Mediterranean were being overfished in 2014 (EC, 2014e). However, the total number of commercially exploited stocks remains considerably higher than the number assessed. In the Black Sea the status of only seven stocks are known and five of them (71%) are overfished. The new Common Fisheries Policy still has to overcome implementation challenges for Europe to reach the goal of fishing at maximum sustainable yield rates for all fish stocks by 2020. These challenges include fleet overcapacity, availability of scientific advice, adherence to scientific advice, an adequate uptake of management measures, and reduction of adverse effects on the ecosystem, particularly damage to the sea floor. Achieving sustainable use of the marine environment is a challenge. The growth of maritime activities such as transport, offshore renewable energy generation, tourism, and extraction of living and non-living resources is taking place without the full understanding of the complex interactions between natural and human-induced changes. It is also taking place in the context of a lack of information on aspects of marine biodiversity and ecosystems. Therefore a key challenge will be to ensure coherence between blue growth on the one hand and the policy objectives of halting the loss of biodiversity and achieving good environmental status by 2020 on the other. This will be necessary for long-term ecosystem resilience and therefore for the social resilience of communities who depend on maritime activities. Climate change is occurring in Europe and around the world. Climatic changes have established new records in recent years: mean temperature has increased, and precipitation patterns have changed. Glaciers, ice sheets, and Arctic sea ice have also decreased much faster than previously projected (EEA, 2012a; IPCC, 2014a). Climate change is a stress factor for ecosystems, putting their structure and functioning at risk and undermining their resilience to other pressures (EEA, 2012b). The key observed and projected impacts from climate change for the main biogeographical regions in Europe are shown in Map 3.6. European seas are affected by climate change through ocean acidification and increasing water temperatures. Coastlines are also vulnerable, facing rising sea levels, erosion, and more powerful storms. Freshwater systems are impacted through a decrease in river flows in southern and eastern Europe, and an increase in river flows in other regions. Freshwater ecosystems are also affected by an increase in the frequency and intensity of droughts (particularly in southern Europe), and by an increase in water temperature. Terrestrial ecosystems exhibit shifts in phenology and distribution, and also suffer from invasive alien species. Agriculture is affected by shifts in crop phenology, shifts in suitable cropping area, changes in yields, and by increased water demand for irrigation in southern and south-western Europe. Forests are affected by storm patterns, pests, diseases, droughts and forest fires (EEA, 2012a; IPCC, 2014a). The provision of ecosystem services is projected to decline across all categories in response to climate change in the Mediterranean region and mountain areas. Both gains and losses in the provision of ecosystem services are projected for the other European regions, and the provision of cultural services such as recreation and tourism are projected to decline in the Continental, Northern and Southern regions (IPCC, 2014a). Stronger and more numerous climate change impacts are projected for the future. Even if greenhouse gas emissions were to stop today, climate change would continue for many decades as a result of past emissions and the inertia of the climate system (IPCC, 2013). While mitigation of climate change is crucial, it is also necessary to adapt to already experienced changes in climate and to plausible future climate scenarios. Adaptation focuses on ensuring that even under changing conditions we maintain the functionality of the different assets that sustain us, including built infrastructure, the natural environment, and our culture, society and economy (EEA, 2013c). Overall, Europe's capacity to adapt is high compared to other world regions. But there are important differences between different parts of Europe in terms of both the impacts they are likely to experience and their capacity to adapt (IPCC, 2014a). In 2013, an EU Strategy on adaptation to climate change was agreed. The Strategy supported mainstreaming (the process whereby adaptation concerns are integrated in existing sectoral EU policies) and funded adaptation actions in countries. It also enhanced research and information sharing. 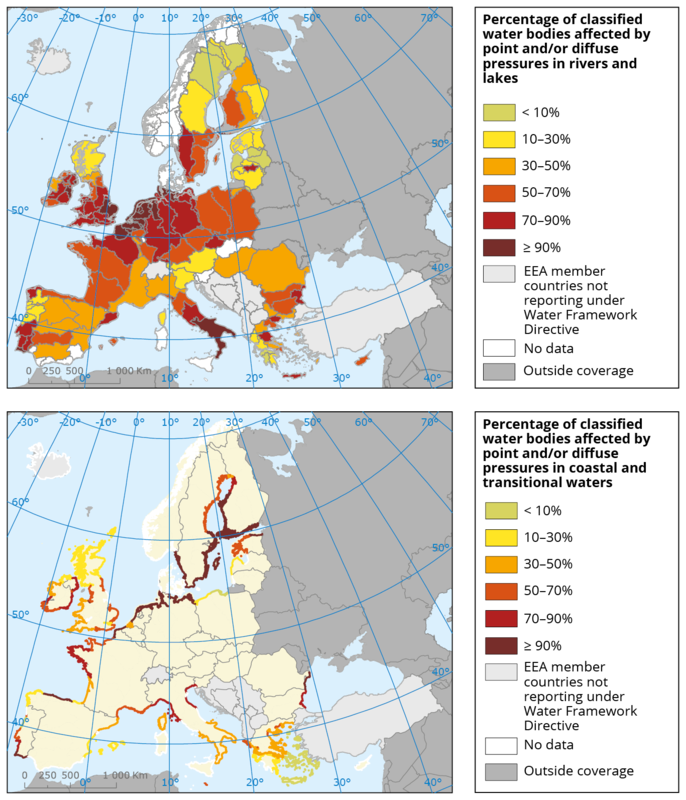 As of June 2014, 21 European countries had adopted national adaptation strategies, and 12 had also developed a national action plan (EEA, 2014n). Climate change risk or vulnerability assessments are available for 22 countries, but information is often lacking on the costs and benefits of adaptation. There is also an information gap regarding the effects of adaptation management actions on biodiversity as empirical studies are quite scarce (Bonn et al., 2014). Development of green infrastructure is an important tool in enhancing the role of nature-based adaptation and the European Commission has published guidelines for adaptation planning for the Natura 2000 network of protected sites (EC, 2013c). Climate change adaptation brings several challenges to the fore. One challenge is the multiple governance levels that must be engaged: Europe needs to respond to the impacts of climate change at local, regional, national and EU levels. Another challenge is integrating the many different sectoral policy areas that are affected: adaptation requires the consideration of multiple synergies and trade-offs between competing objectives. These issues are particularly illustrated by forests. Forests have a multifunctional role, providing a range of services such as the provision of wood and other forest-based products, climate change mitigation and adaptation, recreation, and tourism opportunities. They also have tremendous biodiversity value (Forest Europe, UNECE and FAO, 2011). The need for integrated and adaptive management approaches for natural capital is clear. As illustrated by the case of nitrogen, responses to complex problems can be characterised by fragmented and parallel approaches that lose sight of the bigger picture (Box 3.3). Over the past century, humans have caused changes to the global nitrogen cycle and current levels already exceed globally sustainable limits (Rockström et al., 2009a). Humans have converted atmospheric nitrogen into many reactive nitrogen forms (which are essential for life but occur in limited amounts in nature). In Europe, the supply of reactive nitrogen into the environment has more than tripled since 1900, impacting on water quality, air quality, the greenhouse gas balance, ecosystems and biodiversity, and soil quality (Sutton et al., 2011). Reactive nitrogen is extremely mobile, cascading through air, soils, and water, and changing between different forms of nitrogen compounds. This means that nitrogen management requires an integrated approach to avoid shifting pollution across soil, air, and water, or moving it downstream. It also requires international cooperation and bringing together different disciplines and stakeholders. Existing policies related to nitrogen are fragmented and the European Nitrogen Assessment identified a package of seven key actions for better management of the European nitrogen cycle. These relate to agriculture, transport and industry, wastewater treatment and societal consumption patterns, and they aim to provide an integrated package for the development and application of policy instruments (Sutton et al., 2011). The 7th Environment Action Programme aims to ensure that by 2020 the nitrogen cycle is managed in a more sustainable and resource-efficient way. Within the individual areas presented in this chapter, there has been clear progress on some issues, but in many cases overall trends are heading in the wrong direction. There are critical knowledge gaps relating to the state and trends of ecosystem services. However, progress is being made and work under the Mapping and Assessment of Ecosystems and their Services (MAES) process will make an important contribution in this regard. There are also gaps in legislation, particularly in relation to soil, and these gaps jeopardise the provision of ecosystem services. The recent shift in the policy framework to a more systemic perspective on natural capital marks an important step towards the implementation of integrated management approaches. There are many synergies and co-benefits to a more integrated approach. Action to mitigate and adapt to climate change will increase the resilience of the economy and society while stimulating innovation and protecting natural resources. However, there are also trade-offs that need to be made explicit as there are nearly always costs (either to biodiversity and ecosystems or to people) with any particular course of action. Ecosystem-based management is a critical part of this integrated approach. The goal is to maintain ecosystems in a healthy, clean, productive and resilient condition, which also enables them to provide humans with the services and benefits they depend on. Ecosystem-based management is a spatial approach that acknowledges the connections, cumulative impacts, and multiple objectives that exist in a particular area. In this way, ecosystem-based management differs from traditional approaches that address single concerns e.g. species, sectors or activities (McLeod and Leslie, 2009). The implementation of this approach to the management of human activities — already occurring in the aquatic environment and within green infrastructure development — will provide important evidence and learning to inform the wider application of such long-term, interconnected approaches to tackling systemic environmental challenges. Integrated management approaches also provide an opportunity to correct the prioritisation of manufactured capital over human, social and natural capital. Accounting systems — both physical and monetary — are important to inform policy and investment decisions, because getting the balance right between use, protection and enhancement of natural capital will require information on the current status of stocks. This is a challenge given the enormous scale and diversity of environmental stocks and flows and the need to quantify trends in a variety of different ecosystem elements. Accounts will need to be complemented by indicators that can inform policy development, policy implementation, and monitor progress. The implementation of the revised UN System of Integrated Environmental and Economic Accounting (SEEA), the European Strategy for Environmental Accounting, and the development of ecosystem accounts are important steps forward. The Biodiversity Strategy target to assess the economic value of ecosystem services (and promote the integration of these values into accounting and reporting systems at EU and national level by 2020) is an important policy driver. Protecting, conserving and enhancing natural capital requires action to improve ecological resilience and maximise the benefits environmental policy can deliver for the economy and society, while respecting the planet's ecological limits. Maintaining resilient ecosystems requires a strong, coherent policy framework with an emphasis on implementation, integration, and recognition of the relationship between ecosystem resilience, resource efficiency and human well-being. Chapter 4 will show how improving resource efficiency will ease the pressure on natural capital. Chapter 5 will show how enhancing ecosystem resilience will deliver benefits for human health and well-being.